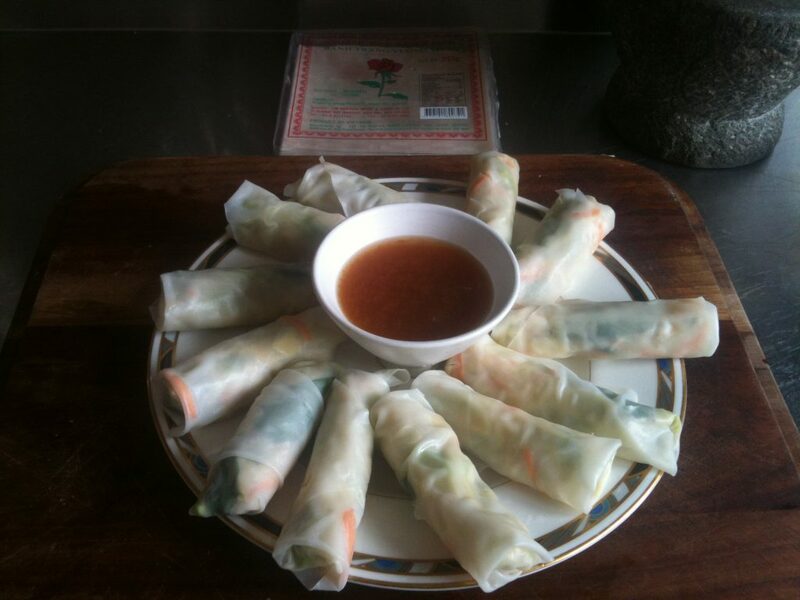 AVOCADO RICE PAPER ROLLS WITH A GINGER DIPPING SAUCE. These make a lovely light lunch for two, or starters for four. The creamy avocado and crisp minty slaw contrast nicely with the hot sweet gingery sauce. You’ll need rice paper wrappers, they come in various shapes but I find square is easiest for rolling up. The trick to these is to have a shallow dish of hand-hot water that will fit a wrapper with plenty of space around the edges at your side. Pop them in one at a time and let each wrapper soak for about 30 seconds. All going well you’ll find it takes about as long to wrap the roll as it does for the next wrapper to soak. You might need to top up the hot water from time to time. 1 spring onion, trimmed and finely shredded. 1 bunch of vietnamese mint, leaves picked from stems and left whole. * note, you can use thai basil, garden mint, or coriander instead or as well. 1 avocado, peeled and cut into sticks. combine the cabbage, carrots, spring onions and herbs in a bowl. Add 3 tablespoons of dressing (see below) and the sesame oil and toss to coat evenly. Pound the chillies and the garlic in a mortar and pestle until they are a paste. Add the sugar and blend into the paste until smooth. Then stir in the vinegar, fish sauce (or miso paste) and lime juice. Reserve 3 tablespoons of the dressing here, and use it to dress the coleslaw part of the filling. 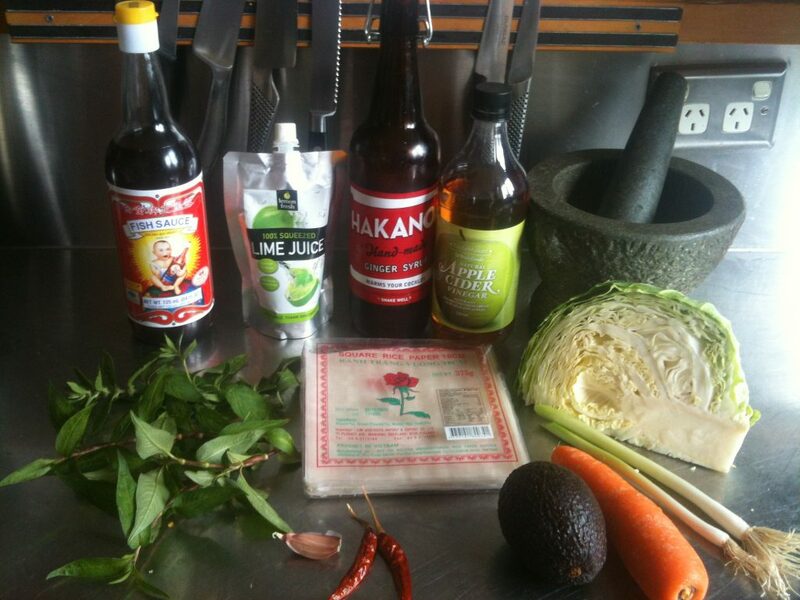 Add 2 tablespoons of water and 2 tablespoons of Hakanoa Ginger Syrup to the remaining dressing mixture. This is now your dipping sauce. Taste test for a good balance of hot sweet salty and spicy. Dip your first wrapper in the hot water and watch until it goes cler and soft, then pull it out straight away. If you leave it too long it will tear. Let it drip dry a little, then put in on a flat board with one corner facing you. Put a fat pinch of the filling in the corner, tuck in the sides and roll it up. Put the roll on a dish with the last corner underneath. Don’t let the rolls touch or they will stick together. For extra prettiness, put a whole leaf of mint on the last corner of the wrapper as you finish rolling. Chill well before serving with the dipping sauce. Rebekah making the rolls in the Hakanoa St kitchen.